Many in Maine still don’t know that one of our country’s most influential historical figures hails from right here in the Midcoast region. The ancestral homestead of Frances Perkins — President Franklin Delano Roosevelt’s advisor, New Deal architect, and first woman U.S. Secretary of Labor — is right here in Newcastle. According to her correspondence, her oral history, her biography, and surviving friends, Frances Perkins’ ethical sense was deeply rooted in her lifelong ties to the modest farmstead in Newcastle, where her family first settled in the mid-18th century. The property once contained an active brick-making operation where many of the bricks were used in building area houses and businesses. Perkins had deep roots in this place; and, it was clear that the Brick House was a constant in her life and the place she considered her true home. This is, unfortunately, one of Maine’s best kept secrets. It’s time we change that. The historically significant Frances Perkins homestead deserves to be purchased, preserved, and managed as an historic site available for the benefit and education of the public. 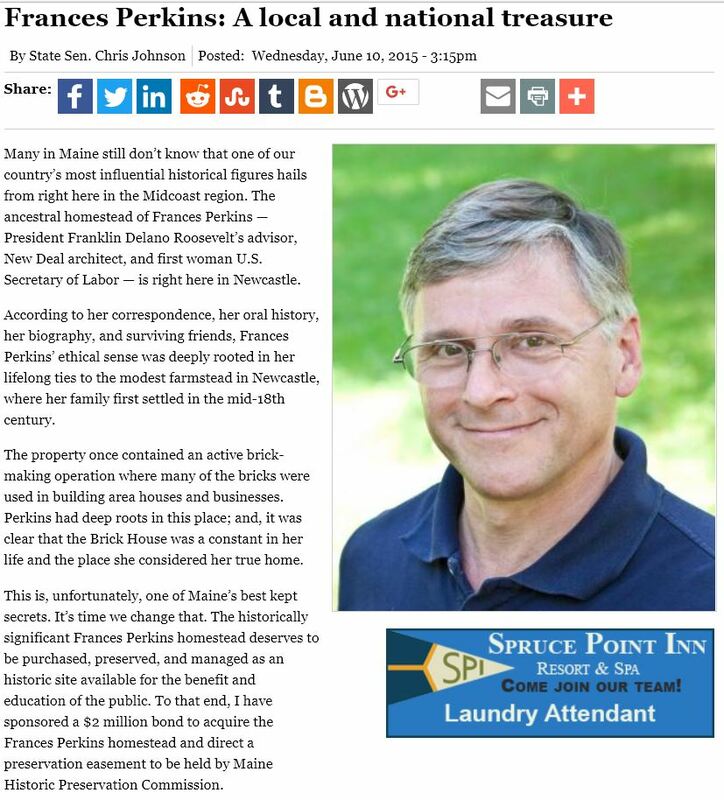 To that end, I have sponsored a $2 million bond to acquire the Frances Perkins homestead and direct a preservation easement to be held by Maine Historic Preservation Commission. The Frances Perkins homestead is on the National Register of Historic Places and is a National Historic Landmark. Joining iconic places like Monticello, Mount Vernon and the Empire State Building, the Perkins Homestead is now among those recognized as the most significant privately-owned historic places in the nation. The acquisition of the property is the next step in preserving and retaining this important historic site for the enjoyment and education of the public about Frances Perkins, including the homestead’s place in history. Today, the Perkins Homestead includes a 57-acre saltwater farm situated on the waterfront on the Damariscotta River with the brick house. Visitors to the site come away with a strong sense of the background and character of one of the most effective public servants of the twentieth century. Frances Perkins holds a prominent place in the history of our nation. As a trusted advisor to Roosevelt and serving as Labor Secretary throughout all 12 years of his presidency, she was the principal architect behind many New Deal policies undertaken to combat the Great Depression and improve the lives and working conditions for generations of Americans. Policies including Social Security, the 40-hour work week, overtime pay, minimum wage, unemployment insurance, a ban on child labor, workplace safety standards, and an expansion of public works projects remain essential to all Americans today. One of the catalyzing moments in Perkins’ adult life was witnessing the Triangle Shirtwaist factory fire in New York City, and the many people who perished leaping from upper story windows. Having witnessed this tragedy, she worked smartly and tirelessly for building and workplace safety. As the first female cabinet secretary to a U.S. president, Perkins opened doors for women. Having to work against great prejudice and lack of professional respect for women in a role of responsibility, she worked doubly hard to stand up for herself and all women following after her, and in a difficult time for this nation, was an amazingly effective Secretary of Labor by any measure. But the publicity and interest of the Frances Perkins homestead would bring more than bragging rights about the first woman cabinet member to a president of the United States; it would also be good for the nearby downtowns and area businesses. The connection with the land, the river, local industry, and historic beauty are what the Twin Villages are known for — making these plans consistent with the reasons people visit Damariscotta and Newcastle, live here, and operate businesses here. The future use of the Frances Perkins homestead as an historical site open to public visits by school groups and tourists alike is entirely in keeping with the character and charm of the Newcastle and Damariscotta Twin Villages of the tidal Damariscotta River. The bond is now before the state’s budget writing committee for consideration. If approved by the committee and the Legislature, it will go before the people of Maine for a vote. I hope with this bond, we can continue to hold Frances Perkins legacy of social justice and economic security alive.